A southeast Iowa farmer who served as president of the Iowa Farmers Union for nearly a decade has been named state executive director for the Farm Service Agency in Iowa. John Whitaker has farmed in Van Buren County, near Hillsboro, since 1979. "I look forward to serving in the Obama Administration and supporting Iowa’s farmers through the avenues that we have in the farm bill," Whitaker says. 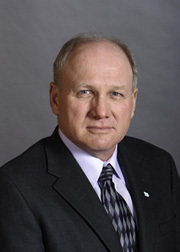 Whitaker was president of the Iowa Farmers Union from 1992 to 2001. He was a Van Buren County Supervisor for nine years, until he won a seat in the Iowa House. Whitaker resigned from the legislature late Friday , when the U.S.D.A. announced his appointment as head of the Farm Service Agency in Iowa. "My main goal is to ensure that farm programs are operated fairly," Whitaker says. Whitaker was raised on a farm in the Hillsboro area and graduated from Harmony High School in 1974. He holds two degrees from Iowa State University — one in animal science, the other in ag education. "A secondary goal, which is really a personal goal of mine, is to do what we can to get more young people involved in production agriculture," Whitaker says. Whitaker made his comments during an interview with the KICD Radio Farm Department. Whitaker, one of his brothers and his son are part of the "all-natural Niman Ranch" network, raising pigs that are never given antibiotics or hormones. Niman Ranch meat is marketed throughout the country. Whitaker is a Mason, a Rotarian and a Shriner and he’s a member of a Baptist Church. Whitaker replaces a former state legislator from southwest Iowa who was appointed state director of the Farm Service Agency by President Bush.